Foreman takes us into the world that is the ton of English society in the 18th century. It is a world where men can be a great many of things and women can support them in this, but not too much or they're accused of being vulgar and improper. Enter the highly spirited and opinionated Georgiana Spencer. At 16 she senses her parents want her to marry the Duke of Devonshire (though they don't push her into this) and as she's always eager to please them, she fancies herself in love with him and accepts his hand. Georgiana soon becomes a favourite in society and is regularly featured in the newspapers. Everything seems to be going well for her, except the one thing that I would think most important: her home life. As is mentioned in the book: the Duke of Devonshire must be the only one NOT in love with his wife. He seems to want nothing of Georgiana except an heir. And in this lies trouble, her first two children are girls. After long years of marriage and scorn from his relatives, she finally does have a son. But not before there is an addition to the marriage: Lady Elizabeth Foster finds a way into their home by befriending Georgiana and somewhat later becoming mistress to the Duke and even having 1 or 2 children by him. Georgiana is no saint, having an affair of her own with Charles Grey and having his child. She's also very active in politics, which is sort of frowned upon by the general public. She holds a lot of both social and political influence. And then there's her gambling problem. Georgiana loses vast amounts of money on a regular base and with their less then warm marriage, she is afraid to ask the Duke for money, so the debts keep piling up. Georgiana seems to have been a loveable person, touching all but her husband. I think it's so tragic that their marriage was like this, perhaps the both of them would have been happier had they been with different people. I can't imagine what she must have gone through having 3 people in her marriage, though she seems to have genuinely loved Bess herself. I was a bit shocked at all the affairs going on! Everybody was going around sleeping with everyone, married or not, having illigitemate children. Georgiana was the older woman in her relationship with Charles Grey and she gave him up when the Duke threathened to take her children away. 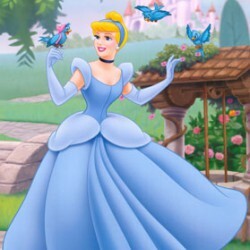 As it was, she was exiled for 2 years to Europe, in this timeperiod she also gave birth to Grey's daughter. I think she made a good mother, though she was really busy with politics. I almost never read non-fiction. I love getting lost in a story and most of the time with non-fiction you don't get that. But I did get a bit lost in Georgiana's world. And though I probably won't read this book as a whole again anytime soon, I really did enjoy it. Foreman's writing is engaging and not just textbook information. Though I won't say I remember all of the political goings on, it was interesting to learn a bit more about this as well. 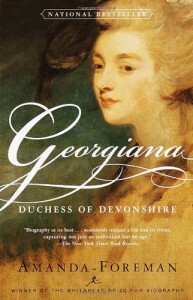 Georgiana is a fascinating historical character and I enjoyed reading about her life.